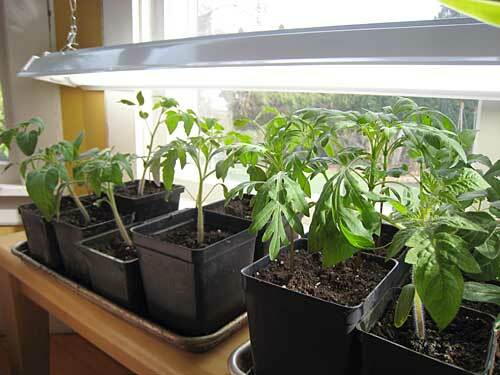 There are 56 reader responses to "Starting Seeds Indoors: Jump-Start Your Garden Today". Unfortunately, in some areas, this is a great way to get your house raided by police on suspected drug charges. I find it helps to keep an attitude of “everything’s an experiment!” and try enough different seedling/gardening projects that some can fail and I can still feel successful and rewarded. This year I’m going to try Belgian Endive, my expectations for success are quite low! Ever grow the plant that closes its leaves like crazy when you Tickle It? My kids love growing TickleMe Plants. They are like pets! Thanks so much for this post, Kris! I’ve been eagerly awaiting it. I’m ready to plant my seeds, but because this is my first year starting from seed, I was looking for some guidance. Well written, clear, and very informative. Much appreciation. Great post, Kris. I am going to file this page away and keep it for when my wife and I start a garden. Oh how I wish I had the space right now, by next year I will. You write in a very reader friendly way and describe this process the best I have seen! You and J.D. both are gifted writers and this blog is a joy to read everyday. What a great article and the steps are very easy to follow. I have never tried this before, but I might give it a shot in the future. What a timely post! I just bought my seeds yesterday. I also picked up seed starter “dome” similar to what you wrote about. LOVE the gardening posts – we just planted our beans and peas on the 1st too. It makes it feel like spring around here! We haven’t tried it yet but I think we’ll do it next week. I’ve already started 16 tomatoes. I’m in the process of switching to only heirloom’s so I can harvest the seeds but I still have some hybrid seeds. One thing for new people to remember, you need to “harden off” the seedlings. Meaning you can’t take the indoor starts and just toss them out into the garden. You need to move them out for a couple of hours at a time. Full direct sun will kill them. This is a great post. I try to start seeds indoors, but usually with mixed results. Your article will make a great reference tool. I read your post with interest and then I got confused about which plants to start indoors. You mention that you started your own lettuce indoor and then you discourage to do that because they don’t transplant well! Is there a typo somewhere? Good catch. We currently have an indoor herb container. These is for herbs we’ve been using over the winter. Kris planted some lettuce seeds in this container, but it’s for our use later this spring, and not for transplanting. We shouldn’t have mixed the two projects together in this post because it’s confusing (even for me!). Thanks for pointing this out! Free plant stakes can be made simply by cutting up a plastic yogurt tub. A diamond of an idea in a post filled with gems. I always have a few of these tubs kicking around. Maybe it’s because I’m still pretty new to gardening or maybe I’m just a little dense, but is there any way Kris could clarify her transplantation method? “Scooping them up from below, try your best to get all their little roots, and handle their tops as little as possible, and always by the leaves, rather than the stem.” I just can’t picture this process in my head for the life of me. I feel silly for asking, but maybe there’s someone else reading this who’s just as confused as I am–one can hope, anyway! Thanks in advance. if you’re worried about damaging the tiny roots, do what i do. I plant my seeds in little waxed dixie cups that fit into the holes of my starter kit and simply label the cup with any info I need. Then the bottom easily peels off from having been wet and you can push the plant up from the bottom to transplant it without having to pull on the plant from above, which can rip the immature roots. You can dust away a bit of the dirt if it’s packed or solid or the roots are balled, but you shouldn’t need to. What a nice, detailed article. Every year, after killing yet another tomato plant, I vow to never try again, but you did inspire me, and homegrown tomaotes are the best! Luci: Here’s a little more detail to help explain the transplanting: If your seeds were started in a flat of soil, then use a plastic spoon to carefully dig around the root area of your seedling and then scoop the entire “soil + root” area into your next-sized pot. By supporting the weight of the seedling from below (on the spoon), you minimize the chance of ripping the poor little thing loose from its roots. If you have started your seeds in flimsy plastic pots, you can often loosen the soil by pushing the pot up from the bottom. Then use a fork or spoon to remove the seedling for transplant. Either way, your goal is to keep as many roots as possible. Never pull seedlings up by the stems. 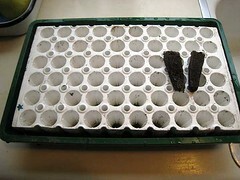 The soil-less plugs I mention above are very easy to transplant because they don’t fall apart the way moist soil tends to, and I can “pop” each plug out of its cell from below with my finger. I hope that helps! Folks that are off the grid can’t always spare electricity to power grow lights — me included! I do have a green room and have had moderate success starting transplants indoors, but my starts still need more light. Large south facing windows and reflectors just aren’t enough and we are making plans to install skylights. The skylights will drastically increase the temperature of the room, though the increased light will hopefully be much appreciated by my plants. I’ve heard that there is a correlation between heat and light and that the hotter it is, the more light the plants will need and vice versa. This is the post I have been waiting for!!! Very well-written with good pictures. I am very excited to start my garden. I’m doing SFG this year. I know there is some controversy on vermiculite and I have been reading that you have to choose “asbestos-free” to be safe. Anyway, on a related note, I know you do some version of SFG but what kind of soild do you use? Did you follow Mel’s Mix? Why/Why not? I am getting ready to put soil on the frame. I appreciate your input. I planted some tomato and cantaloupe seeds about a month ago and they were doing nicely until last week when they all started wilting. Now they’re all lying down completely which can’t be a good thing. Mold started to grow on the containers about a week after I planted the seeds, so I figured I was watering them too much. I started watering them less. Now I’m not sure if they’re dying from not enough water or from the mold. Can mold kill the plants? I only saw it on the outside of the containers, but I assume it was all through the dirt too. My first gardening experiment seems to have been a failure lol. Would like to know how tips to avoid bringing bugs and insects in doors when we move the garden to indoor. Peppers are in soil– regular potting soil, too wet because I decided to really soak it after filling the cells, and I basically broke all the rules. I have twenty-four seeds in right now, seven each of Northstar and Buran peppers and ten California Wonders. Tomorrow, I’ll start messing with the mylar, the light, and the space heater. It’s very haphazard, but seeds are cheaper than plants. Now that you have the dome and the tray – STOP buying the “sponges”. 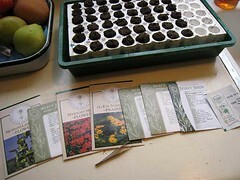 It’s a lot cheaper to fill the trays with regular planting/seedling mixes, rather than keep buying the sponges. 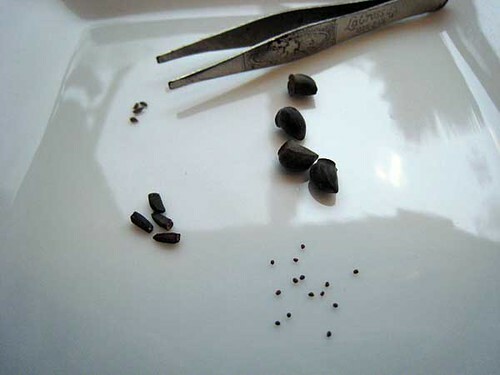 All of these are inert, weed-free, moisture-holding material that is great for seed-sowing. If you buy large bales of peat, you may have to sift it to get finer-textured stuff for seed sowing – save the coarser bits for use in the bottom of hanging pots or as a garden soil additive. Pour boiling water over the material to hydrate and sterilize it (the coco fiber expands to several times its compressed size). Cover the pail and leave it overnight to cool. Drain or squeeze out excess moisture. 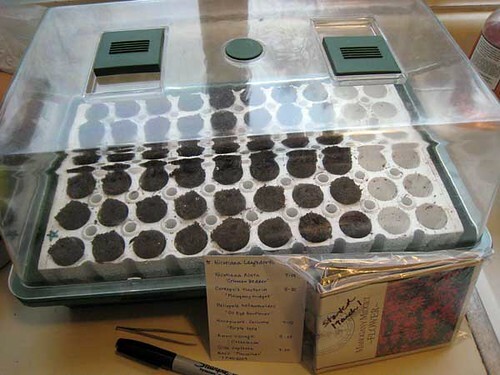 Then pack your seedling tray. Your kit is just a small version of the trays used by commercial greenhouse growers. They run large trays through automatic filling/seeding machines. I was unable to locate the home-size kit here in Israel – so I went to a commercial supplier and bought a few of the large styrofoam trays. I cut them down to fit the clear plastic clamshell containers that fresh produce/baked goods are packaged in. Works just as well as the kits, and cheaper. Stop your car when you see crews planting flowers on road dividers – you can often pick up discarded seedling pots and trays. There are similar, deeper trays for sapling trees – with openings as large as a milk carton on top, tapering down below. Another trick for summer squash, beans, and cucumbers is to pre-sprout the seeds indoors in moist paper towel, and then sow directly. You can gain about a week this way. Often it is easier to use a cloche or other protection outside, than to tend a lot of indoor seedlings. This will be of great help. I am seeding this weekend. Earthbound Farms is giving away free organic heirloom lettuce seeds in celebration of their 25th anniversary. I buy EB Farms lettuce, it’s wonderful! Very timely! Thanks! I’m attempting square foot gardening this year and was nervous about starting seeds indoors. I appreciate the step by step! And I got those free seeds for lettuce from EB Farms that Lynn mentioned! Great article! Last year was the first time I tried starting plants from seeds. I used the shop light and everything. My favorite part was scratching the gardening itch when there was still snow on the ground! I love that GRS goes Gardening frequently. There’s something very poetic about the mirroring of growing plants, flowers and fruits and vegetables with investment, savings, and fiscal responsibility; both can be fun and rewarding – and if done properly offer a lifetime of rewards without any guilt. I started my onions several weeks ago. I start so many seeds indoors, it really does save money. You also get earlier harvests. I love the early harvests! Great post. I do have one question. I have three cats and they go bonkers over any green leaves. How do you keep your cats from eating the seedlings? Thanks for all the great information! I found your blog more informational and helpful than anything else I could find on the web. I’m starting seeds indoors for the first time this year and wasn’t really sure where to start or when I need to start planting. Your info helps so much! Thank you! Oh gosh, folks! There’s a whole ‘nuther world of starting plants from seed outdoors! No lights, no hardening off of plants, no dirt inside! 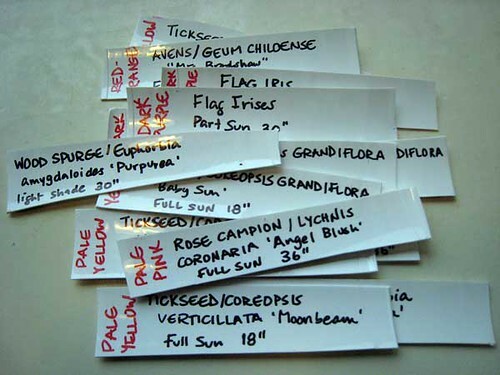 Check out the WINTER SOWING forum on Gardenweb! And start saving your milk jugs and 2 liter bottles for next year. You will need them! These folks start sowing seeds outdoors in jugs and bottles in DECEMBER and up through March. Plus, they have great free seed exchanges. Grab a cup of coffee and hit that link. You will be amazed. Note: This is for all regions of the country, not just the South…. Thank you for this great post! I just came back to it again, because I’m about to start my very first garden and I was looking for guidance on starting seeds indoors (especially from someone following the Square Foot Gardening technique). I do have one question for you. For space reasons, I am going to have to set my seedlings on two different shelves rather than a table. Do you have any suggestions for lighting that wouldn’t require me to buy 8 different fluorescent lights? Our windows all face west and our neighbor’s house is taller than ours, so we don’t get the greatest natural sunlight. I know I’ll need artifical lighting, but can’t figure out the best way to do it given my circumstances. Any suggestions would be greatly appreciated! I live in an apartment in the middle of Los Angeles, with no yard (although there is a beautiful avocado tree right outside my window). If you are ever looking for post ideas, a post on how to grow a small garden (herbs? maybe even some kind of produce?) indoors or in pots would be much appreciated! My daughter lives in LA condo and grows annual herbs in pots on the window sill– basil, parsley, rosemary, etc ;(something like mint wouldn’t do as well–they like to be in the ground.) You can replace them if they tank on you. It is easier if you get transplants and not try every thing by seed if you are a beginner. Most herbs and veggies need 6 hrs of sun. Also a selection of veggies can be grown in large containers (12″ or larger). They just don’t get as large as veggies grown outdoors; they need good potting mix as well as 6hrs or more of sun. Try the mini varieties–names like:Tiny Tim, Midget etc,or “patio” (determinate type) tomatoes; mini peppers; leafy greens (lettuce, spinach). Would your landlord allow you to set your pots outside? That would be best-just be sure to water! All things are possible. Give it a try! Thanks for this advice. Unfortanatly i have already started radishes in my house. Oh well ill just have to see what happens and see if they grow. But i have also started Pumpkins too and i am so excited. The package says they get to be 70 inches around. But i also live in colorado springs, CO so i had to start indoors because lastyear nothing grew much fruit because of a short growing season. Thank You! Thanks for the post and the info! I hope my indoor/ outdoor garden will turn out well!! I know you don’t like recommending one product over another but what seeds would you recommend and where do you recommend to buy them from? Old house. Put trays on table in front of window that faced North. Guess it got some East and West as well? There were 2 front windows facing West. All seedling grew beatufilly without grow lights. New house. Put trays on bench in bow window area; lots of light. One side faces South and somewhat Eest (lot on an anagled street. 2 front ones face(think) South and the other one faces West. Seedlings did not do well. Could this area be too cold with all the windows? Other house was brick; this is vinyl. Could you advise? I really can’t afford to pay electricity for grow lights even if someone gave them to me. Thank you. Is it bad to plant seeds in late May???? What I need to know is: can I start my veggie plants indoors then when they show the first leaves put them in the green house? I want a head start getting plants going in pots. 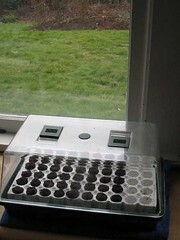 My unheated green house doesn’t get warm enough yet to germinate plants like tomatoes. Great article. This is my first attempt at starting plants from seeds indoors. This was my first search page I pulled up and I have no need to go looking any further. Thank you for such clear instructions. What a lovely and informative post! You are clearly very experienced! Do you use a specific potting soil for tomatoes (once they are mature and in their permanent homes, or a general soil for all your veggies? I live in AZ and seem to be able to grow almost anything I want but have utterly failed at tomatoes! I’ve been serial killing them for 2 years with no fruit. Any suggestions or direction toward helpful posts would be greatly appreciated! I have read and looked at many post of seed starting and gardening. You have done a great job with the details of starting a garden indoors. This will be my first year attempting seeds indoors and not just buying them from a store and putting them in the garden fully bloomed. This is such a great article since I had no idea where to start. Thank you!! This article is wonderful. Very clear and I’m glad for all the tips. Thank you gardening trials are fun and challenging.